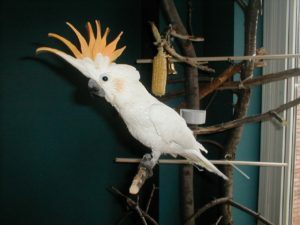 Although they are rarer in aviculture than their close relative the Sulphur Crested Cockatoo, Citron Crested Cockatoos are highly valued by enthusiasts. Citron Crested Cockatoos are social birds, living in pairs or small groups in the wild. They eat fruits, berries, flowers, nuts and seeds in the wild and will associate with Eclectus Parrots or other birds from time to time. An extremely intelligent bird, the Citron Crested Cockatoo can be taught a variety of amusing tricks and will even perform its own original antics to catch your attention! These birds, although they may not be a good choice as a child’s pet, have fairly gentle natures and quickly form loving bonds with their owners. They adore playtime and attention, although they may not be a good apartment bird since they can occasionally be a bit loud. Citron Crested Cockatoos love to chew, and so should be provided with a variety of chew items. They can be kept in aviaries of 15 by six by six feet. When kept in small enclosures, Citron Crested Cockatoos should be allowed plenty of time for exercise. The enclosure will need to be of metal, as these birds can chew right through wire mesh. Generally, Citron Crested Cockatoos may be fed a good seed mix or pellet diet supplemented with plenty of fruits, vegetables and greenfood. Especially nutritious favorites are peas and apples. Of course, they will also need fresh water available at all times. 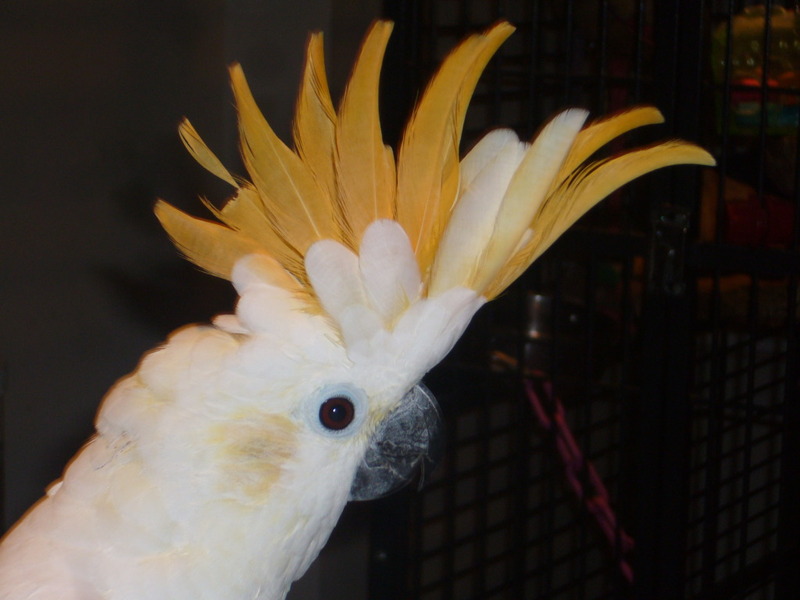 When your Citron Crested Cockatoo is annoyed, it will indicate this to you by raising and lowering its crest, and if it is extremely alarmed it may hiss. Once acclimatized and familiar with you, Citron Crested Cockatoos tend to make hardy and sweetly affectionate pets. 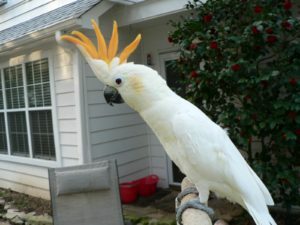 At maturity, the Citron Crested Cockatoo is about 13 inches long. They have pristinely white plumage save over their heads and on the pale golden- washed undersides of their flight and tail feathers. Their crests are the defining feature of the Citron Crested Cockatoo, and are as lovely as they sound in the bird’s name. A bright splash of citrus-like orange-yellow adorns the crest and is complimented by the paler yellow ear coverts. Citron Crested Cockatoos have gray legs and black bills, and they also have black eyes when they are babies. As they mature, the female’s eyes will take on a reddish tinge while the male’s will reman black. Usually, the crest of males may be a bit more impressive than that of a female, and his bill is also usually a bit bigger. Citron Crested Cockatoos are native to the Sumba Islands located off the coast of mainland Indonesia. Sadly, in the wild these birds are very much endangered. 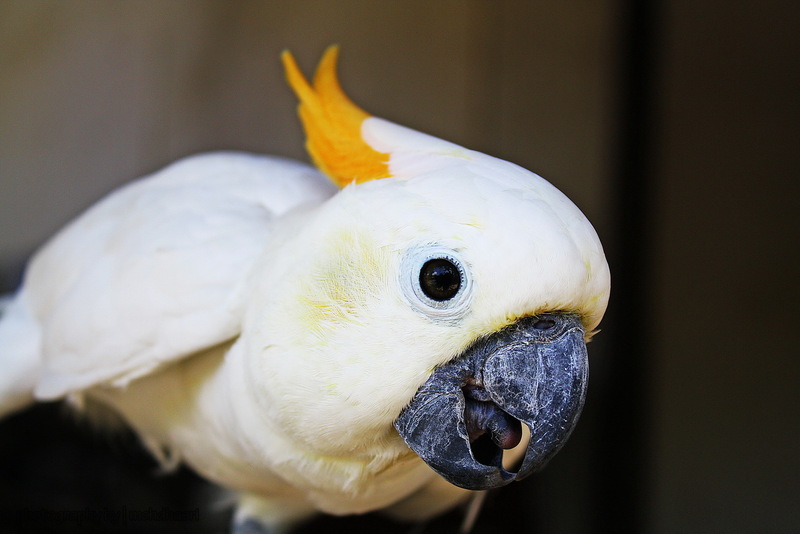 As pets, they tend to be a bit more even-tempered than the Sulphur Crested Cockatoo, and their great beauty makes them a favorite of many people. Citron Crested Cockatoos may be a bit prone to chewing, so be sure they have plenty of items that they are allowed to destroy lest they turn in boredom to their cages or your furniture. When bored, these Cockatoos show a tendency to pluck out their own feathers. When breeding Citron Crested Cockatoos, it is of extreme importance that the breeding area includes hiding places where the female can escape should the male become overly aggressive. During breeding season, male Citrons have been known to kill females. 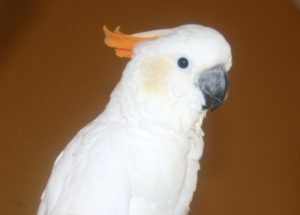 Generally, Citron Crested Cockatoos becomes sexually mature between two and four years of age, and should be placed together with a nesting box in a large aviary for breeding. In the wild, mating occurs between September and October. 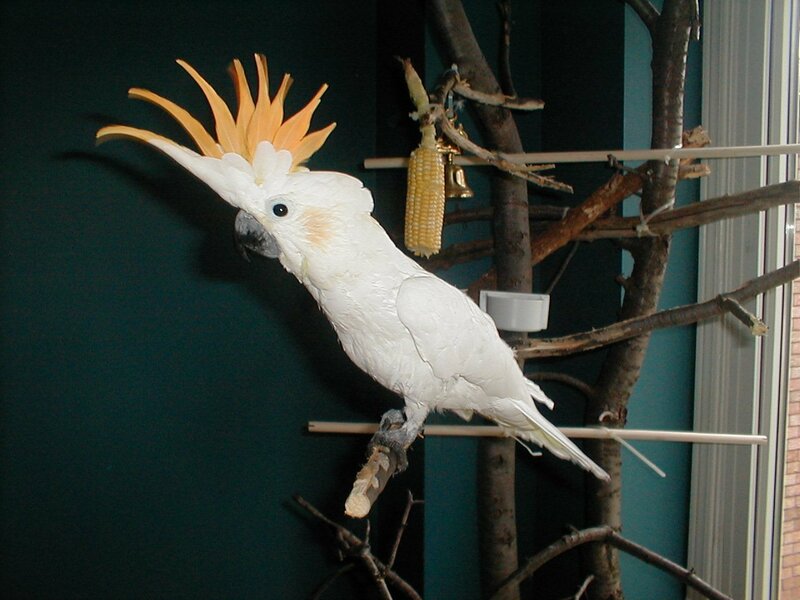 Usually, a T shaped nesting box will be a good choice for the Citron Crested Cockatoo. Although Citron Crested Cockatoos usually lay two eggs, three is fairly common and up to five is not unknown! These birds usually incubate the eggs for about three and a half to four weeks, and the fledgling period lasts between eight and ten weeks. It may be best to remove the young and hand raise them, as parental aggression is not unknown. Citron Crested Cockatoos can breed twice in one year.